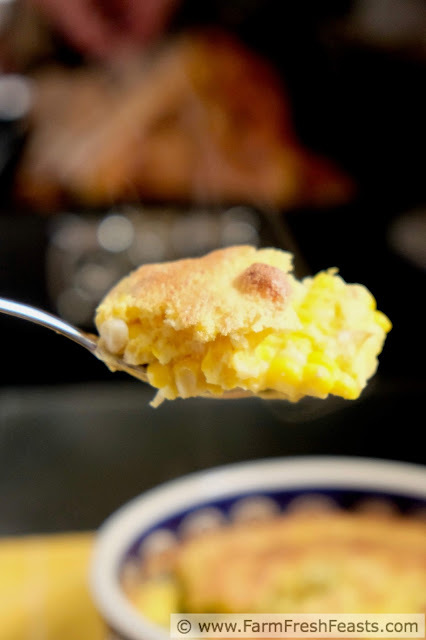 This recipe combines roasted corn and caramelized onions in a light (and dairy free) corn pudding. I am all about inclusion. Is that because I have a disabled kid? Because I love people who are LGBTQ? Because I share meals with folks who have different eating styles? Because I have lived in a country where I was a minority? I dunno. The result is that I strive to make everyone feel welcome at my table. That doesn't mean I choose the lowest common denominator. My octogenarian house is accessible for my son but not for his hockey teammates. 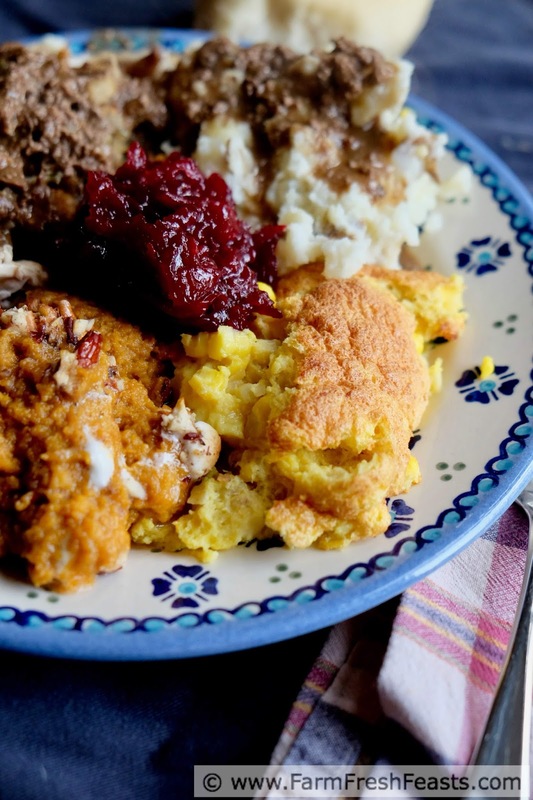 I won't plan an entirely meatless Thanksgiving meal for the lone vegetarian at the table--but I will choose vegetable stock over chicken stock in stuffing or in my Silken Turnip and Potato Soup so that more of the dishes on offer are appropriate for the folks who come together to share the meal. This recipe came about because of two things: my conflicting desires to have a lot of side dishes and a small batch Thanksgiving, coupled with my neighbor hosting her extended family for the holiday and having less control over the food on her table. Her son has a severe dairy and nut allergy, and even well-meaning relatives don't always think it through. "There's no milk or nuts in these Rice Krispie Treats!" "Did you butter the pan?" "Yes! Oh . . . I didn't think of that." 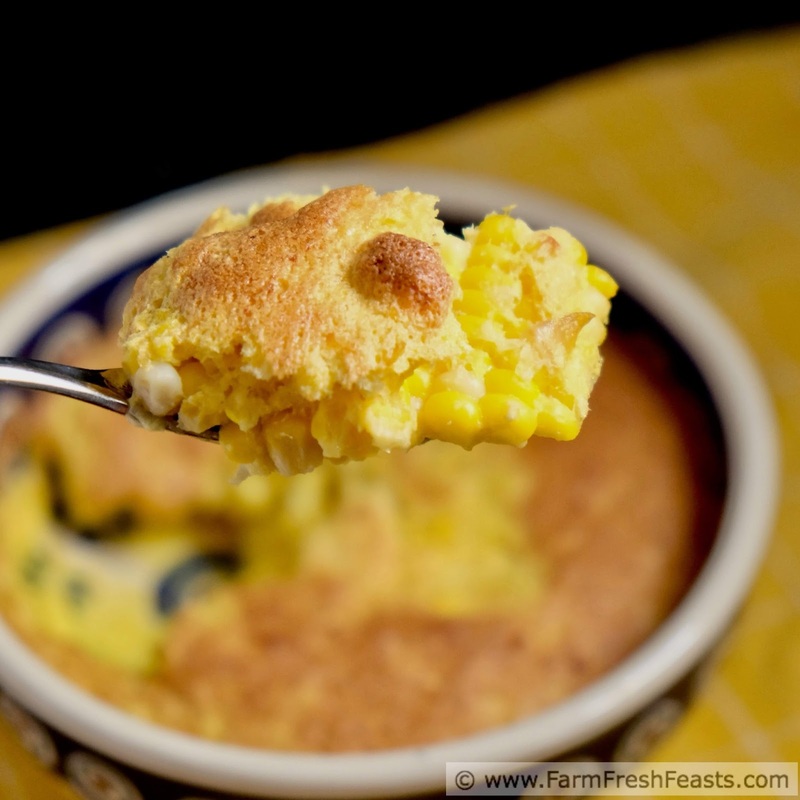 Since I was thinking it through, and wanted the challenge of re-imagining a corn pudding without using a box of corn muffin mix, I offered to bring over a dairy free corn casserole for her table. I figured I could divvy the mixture between 2 dishes so that we'd get variety in our side dishes while she'd get another dish that she knew was safe for her son. When we get corn in the Community Supported Agriculture (CSA) farm share, I have my kids shuck it and get it cooked as soon as I can. [I am not always successful in this goal, but it remains the goal.] We'll enjoy some on the cob, but the rest I cut off the cob and freeze. This provides me with room in the fridge/crisper during the abundant summer months as well as a supply of local foods during the winter months. 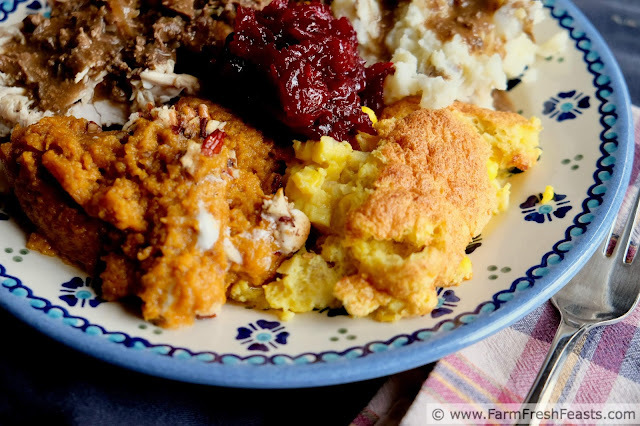 For more Thanksgiving recipes, I made a Clickable Collage of 10 Favorite Thanksgiving recipes. For more recipes using corn, please see my Recipes Using Corn Collection. It's part of the Visual Recipe Index by Ingredient, a resource for folks like me eating from the farm share, the farmer's market, the garden, the neighbor's garden, and great deals on ugly produce at the grocery store. Ok, so while looking over the photos from last year I had to laugh. This was how I used to separate eggs, back before I got a job as a prep cook. Now I'm separating a dozen or more eggs at a time, and I grab a pair of gloves and just use my hands. I still remember how silly I felt on my first day, when I didn't really know how to separate eggs without a tool. So I'm sharing this to show how far I've come. And to show the gorgeous yolk color of a locally-produced egg. Note: This casserole is not very "small batch" like the rest of my Small Batch Thanksgiving recipes. If you only want a small portion, I'd suggest seeking out a source to receive the rest of your batch. Maybe another family has a dairy free guest for the holiday. Perhaps a soup kitchen has guests with dairy allergies. I can tell you that the leftovers reheated well, so there's always that option. Another Note: I call for caramelized onions. I'm partial to Dorothy's slow cooker method, and make a large amount that I freeze in small portions for uses just like this. However, if you want to chop up about ⅓ to ½ cup of onions and sauté them until translucent that would be an excellent substitute for caramelized onions. Those can be made ahead and stored in the fridge for a couple of days until you're ready to assemble the casserole. 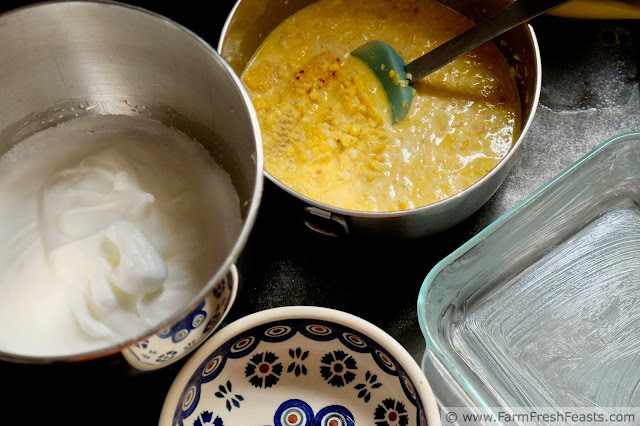 If you've got any kind of frozen corn, that will work just fine in this recipe. Preheat oven to 350 degrees Fahrenheit. 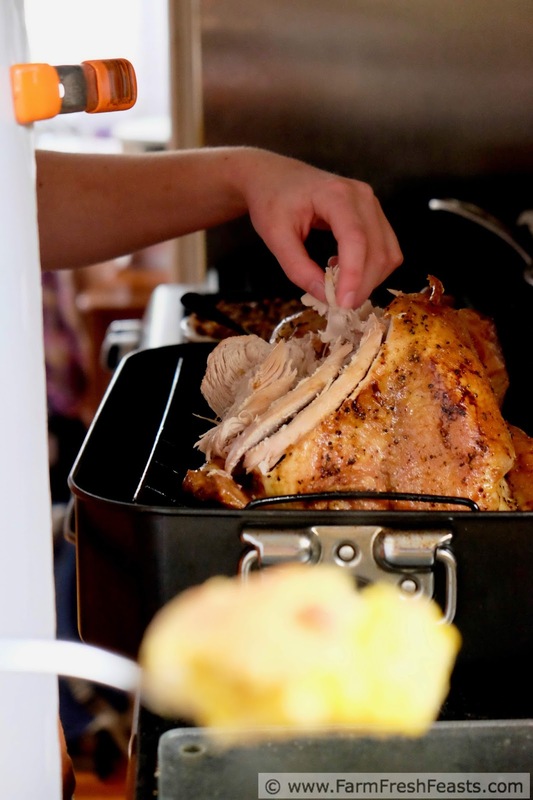 If you're baking this with other dishes that cook at a higher temperature it's fine to bake this slightly higher (375-400 degrees) or lower (325 degrees) just decrease or increase the baking time accordingly. 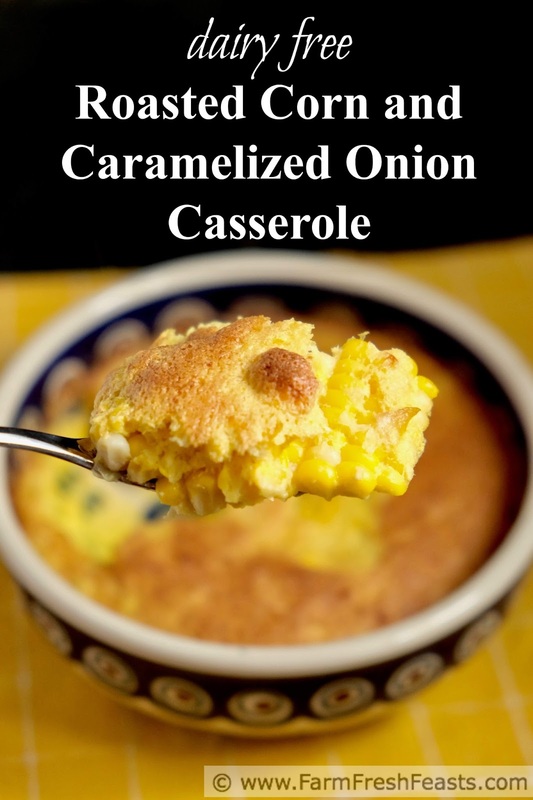 In a medium bowl, combine corn and onions. Set aside. In another medium bowl (I used my stand mixer) beat egg whites until stiff. Set aside. 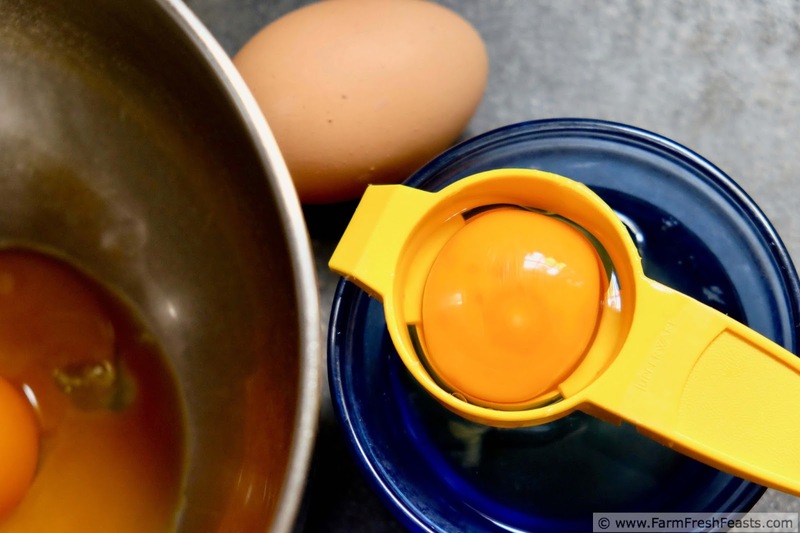 In a large bowl, combine egg yolks, sugar, oil, milk, flour, salt and pepper. Brush a 2 quart casserole with olive oil or buttery spread (mine is dairy free). Alternatively, if you want to serve multiple groups with this mixture, it divides nicely into a 3 cup baking dish and an 8 inch square pan. Brush those with olive oil as well. Turn casserole mixture out into prepared pan. Bake for 30 to 45 minutes, until top is browned and mixture is fluffy and set (not jiggling in the center). It will deflate slightly before serving. Leftovers reheat well, and if you're partial to buttery-tasting spread on your leftovers I won't say a word. Behind the scenes: as I was taking photos, my girl was sneaking some turkey.